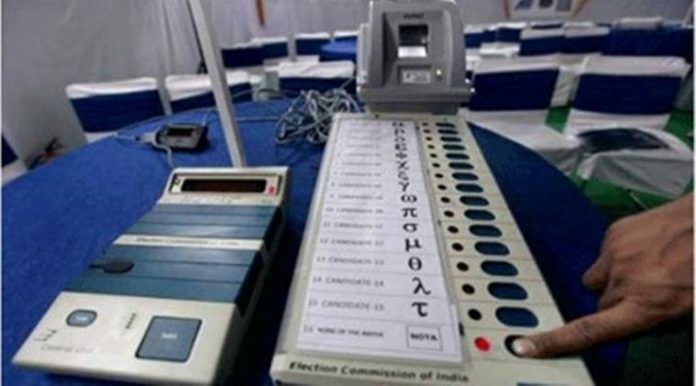 Home 2019 General Elections EVM Malfunctions reported from many polling booths in Jammu. The Jammu & Kashmir National Conference (JKNC) and Peoples Democratic Party (PDP) on the first day of elections, complained that the uniformed personnel assigned at several voting booths in Jammu coerced people to vote for the BJP and in some places the EVMs malfunctioned with the Congress button not working Jammu’s Poonch area. PDP president Mehbooba Mufti tweeted that “A voter at polling booth in Jammu was manhandled by the BSF because he refused to cast his vote for BJP. Using armed forces at polling stations to coerce people to vote for the BJP shows their desperation & hunger to usurp power by hook or crook”. She also posted a video of some voters raising anti-BJP slogans after they were allegedly roughed up by the BSF for not voting for the BJP. National Conference leader Omar Abdullah claimed in a tweet, as polling began for the first day on Thursday, that the Congress button on an Electronic Voting Machine (EVM) in Jammu and Kashmir’s Poonch is not working and similar malfunctions have been reported in at least six voting booths in the state. Abdullah posted a video of presiding officer from Poonch area explaining the malfunctioning of an EVM button.Assuring that voting would resume as soon as possible, the presiding officer was asked which button was not working. “Haath ka button (button showing hand),” he replied. The ‘hand’ symbol is the election symbol of Congress party. Next articleRahul Gandhi urges the voters to “vote wisely”, takes jibe at BJP’s Acche Din”.